A day in the woods with Karen. A short video taken a while back on a walk in the woods with Karen. Nothing exciting, just taking in natural surroundings and "Tuning in"
It was a very relaxing day and Karen got to use her new fire steel and learnt to light a fire with it using cotton wool and Vaseline. A picture that speaks a thousand words. Two Army Veterans plead with the awe inspiring man. 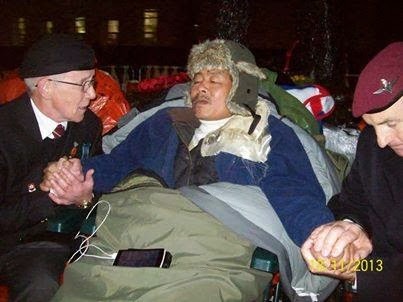 This is a Gurkha Veteran currently on hunger strike opposite Downing St. When this picture was taken last night it was day 12. As you can see he doe...s not look well. We cant allow this great man to die so we need to get this story out there. All they want is equal pensions so they can look after their families. Thats the least we owe them as they have fought for our country alongside our Forces for 200 years. Shame on the Government for ignoring these loyal Gurkhas. Please share this picture everywhere you can think of and lets get these fantastic lads what they deserve. What our Idiot government don't seam to grasp is that this guy will hunger strike with the same absolute determination that he served our country with when he soldiered for it and unless they do something and resolve this he will give his life for the cause just like he would have given his life for this country. Our government should be ashamed of themselves. I served for my country and my mates, not the government. They are all spineless self serving wankers and I despise the lot of them.